Published: Thu, July 3, 2014 @ 12:07 a.m.
Ohio’s natural-gas production nearly doubled from 2012 to 2013 because of activity in the Utica shale play, the Ohio Department of Natural Resources reports. In fact, history was made with a 97-percent increase in natural-gas production; 100 billion cubic feet of gas was produced in both the Utica and Marcellus shales, ODNR officials say. In addition, 3.6 million barrels of oil were produced — increasing production in Ohio by 62 percent over 2012. ODNR released the data Wednesday on 352 horizontal shale wells that reported production in 2013 at Stark State College at the State of Play discussion. “The Utica play is the real deal,” ODNR Director James Zehringer said there. To compare, the Utica shale produced 12 percent of the oil production in 2012 but 45 percent in 2013. The gas production in the Utica was equivalent to about 16 percent of the state’s gas production, and this year it is at least 58 percent if not 62 percent, Richard Simmers of ODNR Division of Oil and Gas Resources Management said at the discussion. The Utica is primarily a unique gas formation, he said. Some of the products brought out of the Utica include ethane, butane and propane. “These are very valuable products, and they make the Utica very unique in the entire nation and for that matter in the world,” Simmers said. The discussion also included facts from Craig Butler, director of the Ohio Environmental Protection Agency; David Mustine, senior managing director, JobsOhio; and State Fire Marshal Larry Flowers. Production data for the first quarter of 2014 shows a total of 418 wells with reported production of 1.9 million barrels of oil and 67 billion cubic feet of gas. 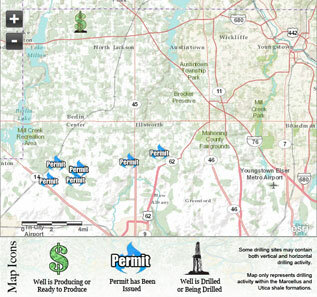 Last year, ODNR projected about 1,300 wells to be permitted and were right on track with 1,386 permitted in the Utica as of June 28 and 44 permitted in the Marcellus. To keep up with production growth, the development of midstream infrastructure is vital to transfer the resources to market. In little more than 24 months, 11 processing plants and miles of pipelines have been established, and companies have spent or committed more than $6 billion on midstream infrastructure. “Companies are investing billions of dollars and creating jobs for Ohioans, proving the value and importance of the Utica shale play,” Mustine said. Butler discussed the 245 general permits issued to oil and gas well sites that provide flexibility to the industry while still ensuring protection of public health and environment using one of the “toughest leak-detection” provisions in the country. “We focus on protecting the human environment,” Butler said.